This afternoon the Yerba Buena Gardens Festival (YBGF) hosted a major project. 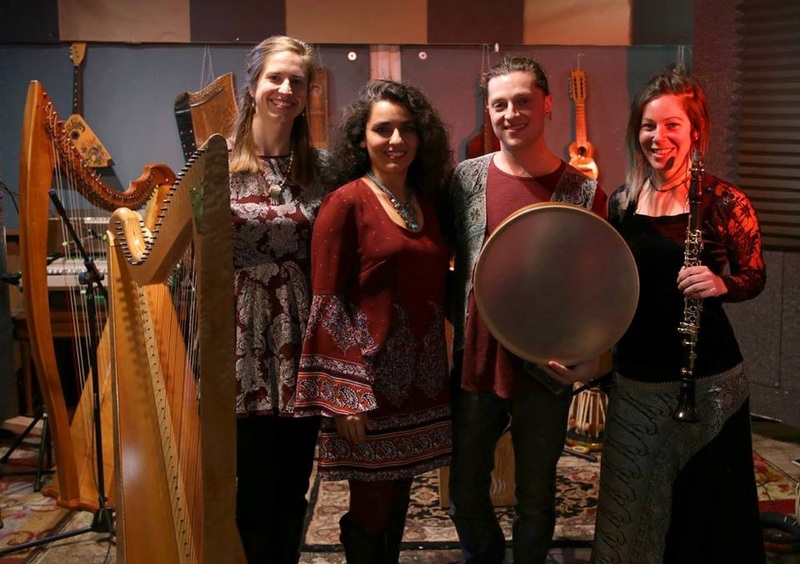 Music of the Banned was conceived by vocalist Dina Zarif as a way to provide a platform for the music of countries, mostly Muslim, whose citizens have had to endure a travel ban imposed by President Donald Trump. Her idea was to invite Bay Area musicians with roots in those countries to perform music representative of their respective background cultures. The project gave its first public presentation at the Red Poppy Art House in August of 2017 as part of the Mission Arts Performance Project (MAPP). This afternoon a similar concert was presented as part of this season’s YBGF programming. Zarif provided some introductory remarks, after which the program got down to business with performances by four groups representing countries that have experienced banned status. 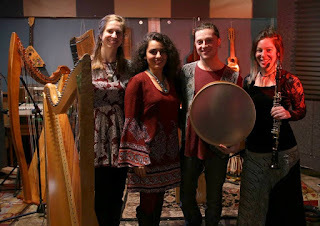 Three of those groups fell into the “mostly Muslim” category: the Ajyal Quartet, whose set was divided between Arabic Syrian music and pieces of Iranian Kurdish origin, Zarif’s own ensemble, whose repertoire she calls “Iranian Fusion,” and the Sudan Ensemble performing with vocalist Salma El Assal. The remaining group was a trio called Sounds of Venezuela. The good news is that this programming offered up an impressive amount of diversity. The not-so-good news was that the slot for the concert ran for two hours and thirty minutes. Because of the diversity of the groups, a generous amount of that time was consumed by set changes, during which one group of players had to dismantle and carry off their gear while another group had to set up a new ensemble of instrumental resources. From a purely personal point of view, the feeling of too much of a good thing began to take its toll after about two hours had elapsed; and I had to come to grips with the fact that the Sudan Ensemble was not receiving the attention it deserved. Nevertheless, before fatigue set in, there were any number of offerings that were decidedly unique in their synthesis of the traditional and the contemporary. Some of them may have simply been historical accidents. Thus, during the Kurdish portion of the Ajyal Quartet set, there was a lively 2/4 dance that sounded for all the world like a hoedown (and probably was intended for a similarly festive occasion). Less anticipated was the polished quality of Zarif’s voice. As her background statement on the Facebook Event page for this concert explained, she is experienced not only in Middle Eastern styles inspired by her Persian roots but also Western classical singing. One result is that her approach to singing during her set featured a finely polished tremolo technique that contrasted sharply (but effectively) with the earthier rhythms of her Persian sources. The result was a concert that showcased both cultural diversity and fundamental commonalities that one encounters in widely diverse instances of music-making. This made for any number of stimulating moments. However, I suspect that my own receptivity would have benefitted from attending two separate concerts, each of which presented only two of the four sets served up this afternoon. He will be followed by the Pet the Tiger Inventors Collective, whose members are David Samas, Bart Hopkin, Peter Whitehead, Daniel Schmidt, Stephen Parris and Ian Saxton. Wednesday, July 25: The program will present a night of sonic exploration entitled The Art of Noise. One set will be taken by SO AR, the duo of Shanna Sordahl (cello with electronics) and percussionist Robert Lopez. They will be followed by multimedia improviser Chandra Shukla, whose XAMBUCA involves a synthesis of auditory and visual stimuli. Thursday, July 26: CarneyVal! will celebrate the memory of saxophonist Ralph Carney, who was active in the Bay Area music community for 28 years. The program will begin with Rubber City, a quartet with two saxophonists, David Slusser and Sheldon Brown, and rhythm provided by Chris Ackerman on drums and Richard Saunders on bass. Slusser and Saunders will then join wind players Karina Denike, Michael McIntosh, Rent Romus, and Phillip Greenlief, along with Myles Boisen on guitar and Suki O’Kane on drums to form the Ralph Carney Memorial Octet. Greenlief will provide the group with arrangements of Carney’s compositions. Friday, July 27: Night of Stone will present a program of exploratory rock and psychedelia. CDP is probably named for the trio of Amanda Chaudhary (keyboards and synthesizers), Tom Djll (trumpet and synthesizers), and Mark Pino (drums), who will be joined by Joshua Marshall on tenor saxophone. The other group will be Dire Wolves, with a front line of Arjun Mendiratta on violin and Jeffrey Alexander on a variety of instruments, not all of which need be recognizable. Rhythm will be provided by Sheila Bosco on drum kit and Brian Lucas on bass. Saturday, July 28: Ask the Ages will feature both locally and internationally acclaimed musicians. Cornet player Bobby Bradford will lead a quartet called Brass ’n’ Bass. He will be joined by Theo Padouvas, also on cornet, and a pair of bass players, Scott Walton and Bill Noertker. The other set will be taken by the KREation Ensemble, led by tenor saxophonist Kevin Robinson with rhythm provided by Lee Hodel on bass and Tony Gennaro on drums. They will perform with pianist Marilyn Crispell. All concerts will take place in the Concert Hall of the Community Music Center in the Mission. The address is 544 Capp Street, which is just north of the northwest corner of 20th Street and between Mission Street and South Van Ness Avenue. Tickets are currently on sale at Early Bird prices. A Festival Pass for all concerts in $80, general admission to a single concert is $15 with reduced rates for students ($10) and seniors ($12). All tickets may be purchased online through a single Brown Paper Tickets event page. Once again the concerts will be preceded by a special film screening. This will be the 2013 documentary The Breath Courses Through Us, which examines the New York Art Quartet, an avant-garde jazz group that was performing during the early Sixties. The screening will take place at 8:30 p.m. on Monday, July 23, in the Concert Hall of the Community Music Center. All single tickets will be $10, and they may be purchased through the same Brown Paper Tickets event page. Finally, there will be two free events on Sunday, July 22. The annual Touch the Gear expo is a hands-on family-friendly event open to the general public. 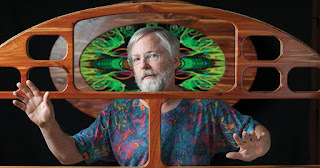 It provides an opportunity for everyone to get better acquainted with the instruments, technologies, and techniques involved in the ways music will be made during the concerts to follow. This will run for three hours, beginning at 5 p.m. It will also take place in the Concert Hall of the Community Music Center. It will be preceded earlier in the afternoon, beginning at 1 p.m., by a skatchbox building workshop led by the two skatchbox virtuosos of TD Skatchit, Tom Nunn and David Michalak. This will also be held in the Concert Hall. Last night in the Old First Presbyterian Church, Ensemble for These Times (E4TT) returned to the Old First Concerts series with a program entitled 56 x 54: Focus on the Cello. 56 by 54 refers to a series of world premiere performances written in response to a Call for Scores issued in 2015, and the results have provided a generous share of the repertoire for recent E4TT recitals. The subtitle involves the fact that cellist Anne Lerner-Wright performed on all ten of the selections on the program, three of which were world premieres, two United States premieres, and two West Coast premieres. Lerner-Wright played two solos, two duets with pianist Dale Tsang, and two duos in which she was the only accompaniment for soprano Nanette McGuinness, as well as being part of the full trio in four pieces. This kept Lerner-Wright busy for the entire evening and included one selection (her first solo) for which she had to retune her lowest string. Lerner-Wright is definitely an impressive cellist. She was clearly up to the full scope of challenges of all of the works on the program; and she could “play well with others” as effectively as she could present her solo work. She even knew how to maintain audience attention with informative comments while retuning her instrument. Indeed, the selection requiring the retuning turned out to be the most engaging work on the program. That piece was the first suite for solo cello written by Greek composer George Hatzimichelakis in 2006. This was one of the works being given its United States premiere, and the very decision to call the piece a suite could not avoid prompting associations with the solo suites that Johann Sebastian Bach composed for the cello. Hatzimichelakis found just the right stance to take in structuring his composition, honoring the Bach formula with a prelude followed by five dances. However, those dances reflected neither the dance forms that Bach utilized nor any of the traditional Greek dance forms. The spirit of the dance, so to speak, was in the composer’s rhetorical approaches to different rhythmic foundations, all of which managed to be “dance-like” without falling back on a reliably steady beat. Hatzimichelakis than departed from Bach in a different direction by following the fifth of the dances with a postlude. This music was as technically challenging as it was imaginative, but Lerner-Wright was clearly up to all of the challenges that Hatzimichelakis posed. This was also true of her other solo presentation, Lawrence Kramer’s “Ricercar,” whose very title evoked memories of music that was “in the past” even for Bach. Here, again, the score demanded prodigious technical proficiency, which Lerner-Wright again delivered effectively. Kramer’s music, on the other hand, was another matter. In the sixteenth century the ricercar was not, strictly speaking, a form. Rather, because the word means “search” (or even “research”), it tended to provide a frame in which a composer might take one or more thematic cells and explore different ways in which those theme(s) could be unfolded, possibly through variations, possibly through imitative polyphony, possibly through “something completely different.” As a result many of the pieces called ricercar tend to go on at some length; and some even suggest that the composer was “improvising with his pen,” so to speak. In the course of my own keyboard work, I have come to feel that a ricercar is more of a dialog between composer and player, rather that something conceived by the composer for a listening audience. Kramer’s ricercar showed few (if any) signs of reflecting on the sixteenth century. On the other hand, the piece did go on for quite some time; and there was some limit to how much of that time could go into productive admiration of Lerner-Wright’s technical skills. As a result I came away with the feeling that my conjecture about the sixteenth-century ricercar was just as valid for the one Kramer had written in 2011. The two pieces that Lerner-Wright played with Tsang were the United States premiere of “Sonia’s Letters” by Frederick Schipizky and a capriccio composed by E4TT Co-Director David Garner in 2014. Schipizky’s piece was sort of a play on words, since his theme was based on the letters in the name of composer Sophia-Carmen Eckhardt-Gramatté. As one can see, this theme is much longer than those based on Bach’s last name or Dmitri Shostakovich’s abbreviation of his, both of which involved only four notes. The result tended to be a bit long-winded, suggesting that this was music that looked good on paper that was still seeking out a rhetorical stance from which it could also appeal to the ear. Garner’s capriccio, on the other hand, was vigorously engaging, making it an excellent choice to wrap up the entire program. Unfortunately, art song is a major element of the mission of E4TT; and last night it was the weakest part of the program. The problem was not so much a matter of McGuinness’ vocal skills as it was one of properly presenting the content to the curious listener. No text sheets were provided to inform that listener about the words being sung, let alone the person who had created those words. Because the textures of instrumental accompaniment were so rich and complex, it was very rare that any of McGuinness’ vocalizing would register through more than the occasional phoneme. For that matter, the fact that “Music I Heard with You” was a setting of a poem by Conrad Aiken only slipped out when composer Tom Flaherty was talking about his work prior to the performance. From past experiences I know that McGuinness takes the words she sings very seriously; but last night even the most attentive listener was lucky to take away even a single word from the vocal offerings on the program. As was the case this month, the next San Francisco offering by Pocket Opera will be given at the middle of next month. This is likely to be the most familiar offering of the season, Wolfgang Amadeus Mozart’s K. 492, The Marriage of Figaro. When this opera was first presented, it was controversial on a variety of counts. The libretto by Lorenzo Da Ponte was based on a play by Pierre Beaumarchais. Beaumarchais had been an overt supporter of the American War of Independence, and his sympathies with those opposing the French monarchy were no secret. This did not go down well with Imperial Hapsburg thinking in Vienna. The title of Mozart’s opera is actually the subtitle of Beaumarchais play. The main title of the play is La folle journée, translated as “the crazy day” by Heather Mathews at the San Francisco Conservatory of Music when she supervised a production of the opera there. This may be the most famous opera whose entire plot takes place in less than 24 hours. To say that the narrative unfolds at a rapid pace is practically an understatement! 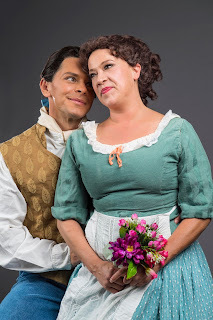 The title role will be sung by bass Dan Yoder; and his bride-to-be, Susanna, will be sung by soprano Aimee Puentes. The opera will be sung in English to allow all the madcap details of the plot to have their greatest impact. The director for this production will be Jane Hammett. This performance will take place at the Legion of Honor, beginning at 2 p.m. on Sunday, July 15. The Legion of Honor is located in Lincoln Park. It is approached by following 34th Street north of Clement Street (which is the southern boundary of the park). General admission is $50 with a discounted rate of $45 for seniors. Tickets will be sold at the door beginning at 1:30 p.m. Tickets are also available at the presale rate of $47 for general admission and $44 for seniors. Presale is being processed online through a Vendini event page, which allows for individual seat selection. Yesterday afternoon in Davies Symphony Hall, the San Francisco Symphony (SFS), led by Music Director Michael Tilson Thomas (MTT), gave the first of three performances of the final concert of the 2017–18 season. The program consisted entirely of Gustav Mahler’s third symphony in D major, a work that usually runs about 100 minutes in duration. While this is not Mahler’s longest single composition, its first movement is the longest single movement that the composer wrote, usually lasting more than half an hour. Indeed, Mahler specifically structured the symphony into two parts. The first consists only of the first movement, while the second part consists of the remaining five. Mahler originally drafted a program, of sorts. The first part was called “Pan Awakes. Summer Comes Marching In (Bacchic procession).” The movements in the second part all have titles of the form “What … Tell[s] Me,” that space filled in by “the Flowers in the Meadow,” “the Animals in the Forest,” “Humanity,” “the Angels,” and “Love.” The original plan included a movement for “the Child;” but that movement became the conclusion of the fourth symphony in G major. By the time Mahler began work on this symphony in 1895, he was no stranger to the epic scale. He had already composed his three-part cantata Das klagende Lied (song of lamentation), which he completed in 1880 but revised for the following two decades. This piece involved full orchestral and vocal (both choral and solo) resources and lasted over an hour. (Mahler turned twenty in 1880.) Then there was the second symphony, completed in 1894, whose last two movements again turned to vocal resources, again both choral and solo and whose first movement amounted to a funeral march on a prodigiously prolonged scale. In this context the third symphony amounted to the next step in Mahler’s ongoing pursuit of intense expressiveness in a grandiose setting. Since this is the month in which San Francisco Opera is giving three complete performances of Richard Wagner’s Der Ring des Nibelung (the ring of the Nibelung), the timing would seem appropriate for large-scale Mahler to be presented across the street. However, it may be worth considering the wisdom of a conductor who had considerable experience in both performing and recording the major works of both Mahler and Wagner. Georg Solti once observed that, of the four Ring operas, the first, Das Rheingold (the gold of the Rhine) was the most difficult. This was because it had no intermission: four episodes unfold over the course of about two and one-half hours. Solti observed that, because the major climax came at the end of the opera, the conductor had to make sure that both instrumentalists and vocalists had not used up all of their energy prior to that climax. Fortunately, the Mahler third provides plenty of opportunities for the players (and, for that matter, the conductor) to “recharge” between movements. Nevertheless, from the listener’s point of view, there was definitely a risk of too much energy too soon. The symphony begins with six measures of eight horns playing the opening theme in unison with a fortissimo dynamic. However, the response comes from strings, timpani, and only a few other instruments; and the fortissimo of that response was just not up to the full-bore decibel strength of those eight horns. As a result, things were already in danger of being out of whack before the first page was turned; and, while there was no shortage of compellingly expressive events that MTT delivered masterfully, there never seemed to be quite the well-planned start-to-finish conception that was realized that last time he led this piece in 2014. Indeed, the overall conception of balance never quite hit the mark; and, even more distressing, there were several noticeable glitches, which suggested that the time for final polishing never arose in the rehearsal schedule. Things fared generally better on the vocal side. Mezzo Sasha Cooke, who had performed in 2014, returned; and the warmth of her deep tones was as compelling as ever. The interplay of the Pacific Boychoir with the four pitches of the tubular bells definitely summoned up the “angelic” connotations of the symphony’s penultimate movement. The text for this movement was the “Es sungen drei Engel” (three angels sang) poem from Des Knaben Wunderhorn, realized as a dialogue between the women of the SFS Chorus (prepared by Director Ragnar Bohlin) and Cooke in the role of Peter coming to terms with his sins before being admitted into heaven. This verbal acknowledgement of salvation led without pause into the final movement, the other long movement of the symphony, although its duration is usually only a bit more than 20 minutes. There is a sense of overall stillness to this movement, as if the only sense of progress comes from the gradual increase in dynamic level. I agree with the observation of the late Michael Steinberg in the program book that “Mahler invites association with the slow movement of Beethoven’s last quartet, Opus 135.” I am one of those who feels that Beethoven is at his best in evoking stillness to the point of making time seem to stand still, and the movement Steinberg cited shows Beethoven at the top of that game. 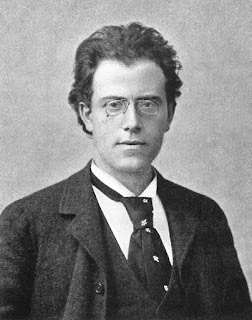 Mahler was going for the same effect; and, for the most part, MTT gave the best account of how the composer succeeded in that ambition. If there were bumps along the way, the journey through the final measures of this symphony was as compelling as ever; and the last six measures of fortissimo were downright triumphant. Events at The Lab are usually announced through the weekly Bleeding Edge articles. However, The Lab put out advance information about a concert taking place next month; so it seemed desirable to allow readers to take advantage of the “early warning.” The program will present two highly adventurous sets, one by visitors and the other by local talent. 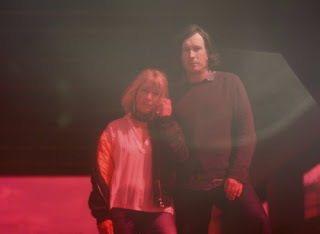 The visitors will be Body/Head, an experimental electric guitar duo, whose members are Kim Gordon and Bill Nace. Gordon also provides vocal work, and just about every sound they make involves some form of electronic manipulation. Gordon originally established herself as a member of Sonic Youth; and Coming Apart, Body/Head’s debut album, amounted to a continuation of her work in the rock genre. 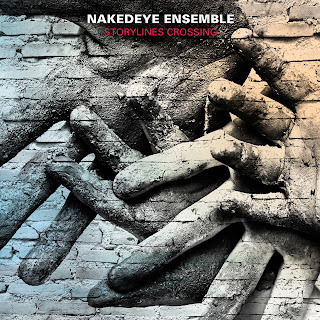 However, in the years following that first release in 2013, the pair has moved into the far more adventurous territory of free improvisation based on “lexical” building blocks of sonorous “objects” and “instances.” Their most recent album, No Waves released in 2016, amounts to a document of extended improvisations. Performance has thus transmogrified from a sequence of discrete songs into a single multi-movement composition organized around a slow-moving narrative. The local group consists of two performers in Angst Hase Pfeffer Nase. (The name of the group consists of the four German nouns for fear, bunny, pepper, and nose.) The group first established itself through tape collage work and then ventured into musique concrète. Now they do small-band performances involving spontaneous improvisations. At this particular concert the “small band” will consist of guitarist Chris Cooper, also working with electronics, and Jessica Goddard utilizing more advanced technologies. This concert will begin at 9 p.m. on Saturday, July 14. The Lab is located in the Mission at 2948 16th Street. This is a short walk from the corner of Mission Street. This is particularly good for those using public transportation, since that corner provides bus stops for both north-south and east-west travel as well as a BART station. Admission will be $20 and $15 for members. Seats may be reserved through a login Web page for members and a guest registration Web page for others. Doors will open at 8:30 p.m., and it is usually the case that a long line has accumulated before then. The thoroughness of his eclecticism would probably have been enough to justify the claim that Gulda was the most interesting pianist during the second half of the twentieth century. However, the prodigious approach he took to establishing his classical chops would almost have been enough to warrant that distinction. His discography includes both books of Johann Sebastian Bach’s The Well-Tempered Clavier, the complete piano sonatas of both Wolfgang Amadeus Mozart and Ludwig van Beethoven (as well as the latter composer’s five cello sonatas, which he recorded with Pierre Fournier), and Claude Debussy’s 24 piano preludes. When he died on January 27, 2000 at the age of 69, the world lost a musician whose grasp of the immediacy of performance experiences could not be equalled. At the middle of last month, Berlin Classics released an album through which we can appreciate that immediacy in a highly personal context. All of the tracks come from personal recordings that Gulda made with his own tape equipment. As might be guessed, this was not optimal source material. The booklet notes by Producer Christoph Stickel described the tapes as being “in a deplorable state.” The recordings were made in 1978 and 1979; and at least some of them seem to have been made before a concert audience, as can be assumed on the basis of the applause included on the tracks. All of the recordings are monophonic. The resulting album is devoted entirely to music by Bach: six prelude-fugue pairs from the second book of The Well-Tempered Clavier, the BWV 903 “chromatic” fantasy and fugue in D minor, and the BWV 807 (second) “English” suite in A minor. What makes these recordings distinctive (and justifies Stickel’s Herculean efforts to remaster their content) is that all of these selections are played on a clavichord. Sadly, this instrument is probably best known for showing up in mistranslations of Das wohltemperierte Klavier as “the well-tempered clavichord;” but it may well be the most interesting member of the keyboard family. Ironically, the most important attribute of the clavichord is that it is barely audible. It was never intended as a concert instrument. 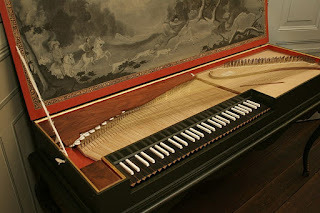 In Bach’s day it would have been used for practice in settings where living quarters were modest; and it was probably used as a “working instrument” by composers. Thus, both students and composers could go about their business without bothering anyone in their immediate vicinity. It was probably also the first instrument in which the strings were struck, rather than plucked. Each key struck only a single string with a small metal blade called a tangent. There was no “action;” so every movement of the key corresponded directly to a movement of the tangent. The most important consequence of this design was that the performer could achieve a vibrato effect by vibrating the key itself. It is reasonable to assume that any performance that Gulda gave before an audience would have had to require amplification. However, through that amplification, one could appreciate that he could take more gradual approaches to changes in dynamic level than a harpsichord would have allowed; and he could embellish any single note with a vibrato impossible to achieve with any other keyboard instrument. As a result, every selection on this new CD is given a truly “ear-opening” account. 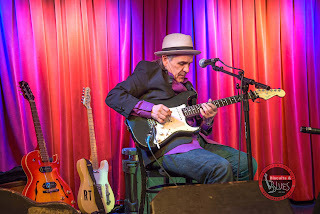 I would even go so far as to suggest that, while the spontaneity that Gulda brought to these performances was entirely consistent with his jazz background, the very sound of his instrument often borders on the sonorities of a rock guitar, whose amplification equipment can transform the sonorities as well as the dynamic level. For that matter, when I listen to Trey Gunn’s stick performance of the fantasy section of BWV 903, a “regular” offering at concerts given by the Robert Fripp String Quintet during the Nineties, I have to wonder whether Gunn had been exposed to what Gulda could do with a clavichord. This is definitely a recording for those who think that they have “heard it all” where performances of Bach are concerned. The Calendar Web page for the Center for New Music (C4NM) seems to indicate that things will be relatively quiet next month. As of this writing, only five concerts have been planned for the month of July. Given how busy the season has been at just about every venue that I frequent, I am not surprised that at least some of those venues feel a need for a rest. As always, I shall do my best to update this particular article if further concerts are announced, using my Facebook shadow site to get out the word about those updates. Wednesday, July 11, 8 p.m.: The Ochs Shelton Quartet will be able to celebrate the confluence of all four members being in the same place at the same time. The group is co-led by Rova saxophonist Larry Ochs (tenor and soprano) and Aram Shelton (alto saxophone and clarinet). Rhythm is provided by Scott Walton on bass and percussionist Kjell Nordeson. Both of the leaders prepare the compositions for the group; but these are pieces that allow for open-ended improvisations by all four of the members. This concert will serve as a prelude to a recording session. General admission will be $10 with a $9 rate for C4NM members. Sunday, July 15, 2 p.m.: The Sky Was Beyond Description will be a concert of music for koto and bass koto written by the resident composer of the Wooden Fish Ensemble Hyo-shin Na. All of the works will be played by Wooden Fish koto player Shoko Hikage. General admission will be $15 with a $10 rate for C4NM members. Saturday, July 21, 7:30 p.m.: Apparently, Julia Ogrydziak’s five-part HUSH Series is extending beyond its original conception of five concerts. 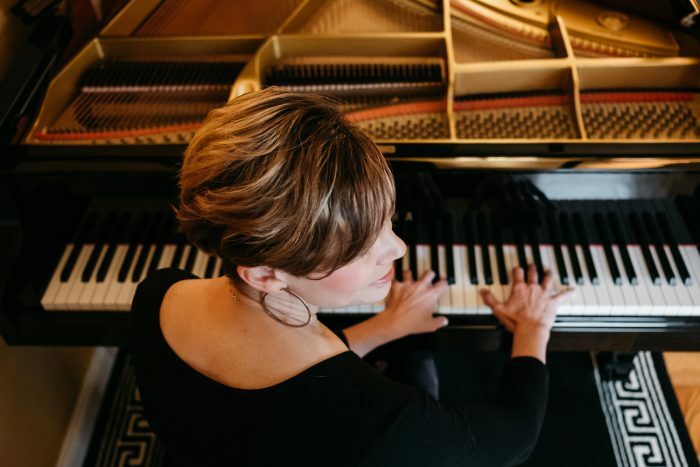 She will curate a solo piano recital by D. Riley Nicholson. Last January Nicholson supplemented his premiere performance of his “Shimmer” will selections from The Book of Sounds, a suite of twelve compositions by Hans Otte. For this event Nicholson will play The Book of Sounds in its entirety. The entire performance should last about 70 minutes. Casual seating and drinks will be on hand. General admission will be $15 with a $10 rate for C4NM members. 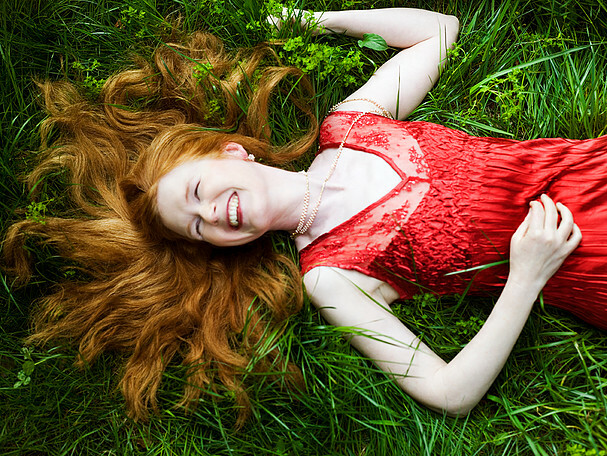 Friday, July 27, 8 p.m.: Emma Logan will curate a solo recital by violinist Robert Simonds. The program will consist entirely of compositions by American women. The composers on the program will be Missy Mazzoli, Cindy Cox, Patricia Van Ness, TJ Cole, Molly Joyce, Elizabeth Kennedy Bayer, and Alexis Bacon; and their works will offer an impressive diversity of influences. General admission will be $15 with a $10 rate for C4NM members, students, and seniors. Monday, July 30, 8 p.m.: The month will end, as it began, with an evening of improvisation featuring a member of the Rova Saxophone Quartet. Playing a variety of wind instruments, Steve Adams will be part of an improvising trio, whose other members will be Michael Vlatkovich on trombone and Tom McNalley on guitar. General admission will be $15 with a $10 rate for C4NM members. Thursday, June 28, 8 p.m., LSG: This week’s installment of the LSG Creative Music Series will offer three sets. The major offering will come from Sunken Cathedral, which currently consists of Ryan Jobes, Kelly Ann Nelson, and Jake Johnson, all performing on a variety of synthesizers. Their repertoire consists of long-form compositions deeply rooted in minimalism, musique concrète, and impressionism. The group’s name is clearly an instance of that last influence, since it is the title (translated into English) of one of Claude Debussy’s solo piano preludes. The other two sets will be taken by Morher, which applies analog sound manipulation to both vocalization and biometric data, and Kole Galbraith, who works with drones on instruments usually found in rock bands. LSG is located at 1007 Market Street, across from the corner of Golden Gate Avenue and Taylor Street; and admission is on a sliding scale between $8 and $15. Friday, June 29, 8 p.m., C4NM: Drummer and composer Vladimir Tarasov will be visiting from Vilnius. He will join local musicians Chris Brown (piano and electronics), Jason Hoopes (bass), and Jon Raskin (saxophones) for an evening of improvised music. C4NM is located at 55 Taylor Street, half a block north of the Golden Gate Theater, which is where Golden Gate Avenue meets Market Street. General admission will be $15 with a $10 rate for C4NM members. Tickets may be purchased in advance through a Vendini event page. Yesterday afternoon at the Old First Presbyterian Church, the Old First Concerts artist was pianist Amy Stephens presenting a program entitled The Art of Third Stream. 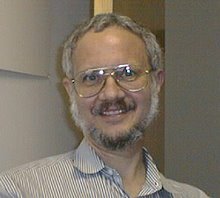 To the extent that “third stream” was a “movement,” it seemed to me, during my student days, that it was little more than a haven for intellectuals in the “new music” community to claim that they could “dig” jazz and for the more avant-garde jazz musicians to place themselves on the same plane as the post-Webern modernists. It has been a long time since I have seen or heard that phrase uttered. It brings to mind the old joke about the Sixties: If you can remember the third stream, you probably weren’t there. With all that as context, I have to wonder how Ellington would have reacted to Stephens’ program on the basis of his all-embracing sentence. I have this fantasy of Will Rogers delivering his famous line, “I never met a man I didn’t like” and then coming face-to-face with Donald Trump. Ellington could be very generous in his tastes, but he was very disciplined in his practices. No such discipline was on display yesterday afternoon. Instead, the curious listener was flooded with a bevy of short pieces, most of which involved little more than repeating simple tunes, by a variety of composers, most of whom seemed to have very little to say. (Stephens was one of those composers.) Furthermore, if there was any content in any of the selections, it tended to be obscured by Stephens’ rather featureless approach to her keyboard work and a sense of phrasing that was, at best, arbitrary. It seemed as if the very practice of making music were in jeopardy, regardless of whether it was trying to “go with the flow” of one mainstream or another (or some confluence of the two). Things got a little better during the second half, when Stephens was joined by a combo consisting of her longtime colleague Tom Clark on saxophone and three local musicians, Alex Farrell on bass, Michael Dallara on drums, and Rebecca Kleinmann on flute. The five tunes the group played were, again, on the simple side; but Clark endowed them with enough shape and shading to make them tolerable. In addition Farrell definitely deserves more than a few nods for taking full and imaginative advantage of the bass solos allowed for him. 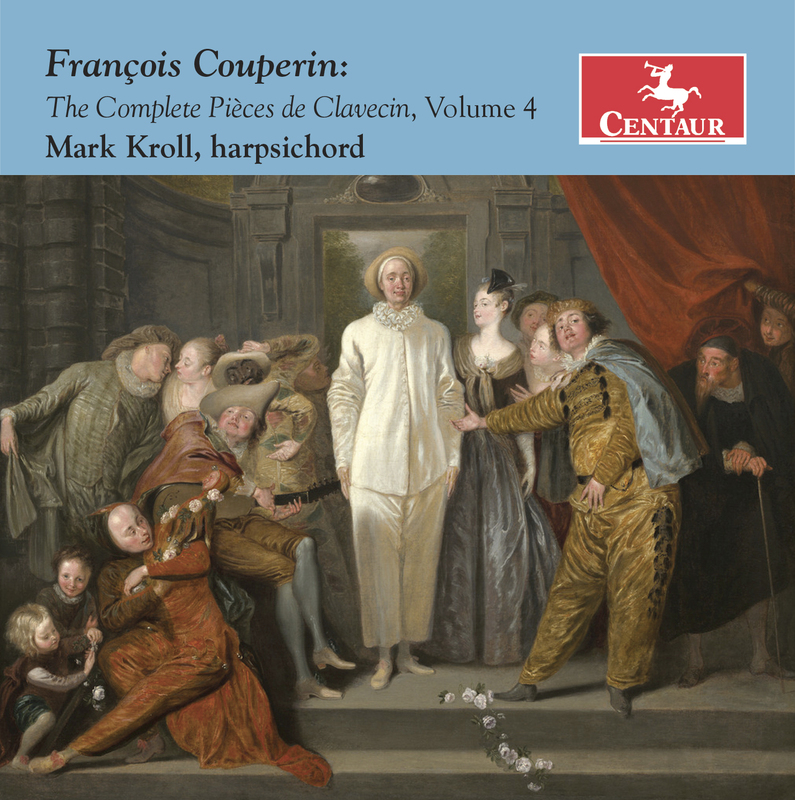 This past February there was a curious glitch in the way in which Centaur Records was rolling out its releases for harpsichordist Mark Kroll’s project to record the complete keyboard works of François Couperin. The third volume in this series had been released in October of 2017; but this was followed, this past February, with the release of the fifth volume! One sad result of this disruption is that I spent more time venting over my frustrations with Centaur than with accounting for the highly satisfying contents of that fifth volume. I am now pleased to report that, as of the beginning of this month, order has been restored to Kroll’s universe of Couperin’s keyboard music. Amazon.com now has a Web page for the fourth volume; and, while stock is low, orders are definitely being processed and additional stock is “on the way.” Once again this is a single CD presenting three of the ordres , the seventh in G (“major-minor”), the nineteenth in D major-minor, and the 21st in E minor. Once again it is clear that Kroll has been giving particular attention to selecting specific instruments for each of the ordres he records. The harpsichord maker that dominates this fourth volume is Pascal Taskin. The nineteenth and 21st ordres are played on a 1769 Taskin instrument from a private collection. (This is the same instrument that was used to record the 22nd ordre on the fifth volume.) The seventh ordre, on the other hand, is played on a harpsichord made by William Dowd in 1974; but the instrument is based on Taskin designs. Sadly, Centaur continues to be consistently negligent in providing background information, either by including the CD booklet as part of their download or by making that information available on their Web Site (which seems to have been abandoned in 2015). Therefore, it is difficult (if not impossible) to find a reliable source that explains why particular instruments were chosen for particular ordres. Suffice it to say that there is consistent clarity across all of the pieces that Kroll plays on this new release. 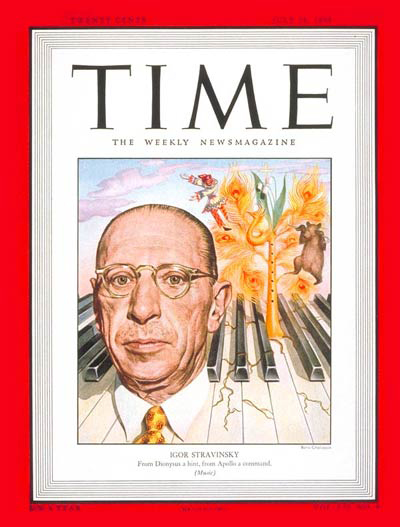 Presumably that clarity depends on choice of instrument as well as Kroll’s own technique, but the nature of that dependence is left as an exercise for the listener! June turned out to be a very busy month, and it has not yet concluded. Nevertheless, there has been time to prepare for July activities at both the Red Poppy Art House and the Old First Concerts series. This makes it a good time to assume that the July schedule for the free Union Square Live concerts has been finalized. Once again I shall simply summarize dates, times, and genres. Any further information should be available through the Events page created by Union Square Live for their Facebook site. 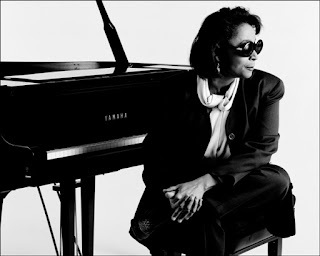 During the week of the last of the three performances of the entire cycle of Richard Wagner’s Der Ring des Nibelung by the San Francisco Opera (SFO), the Saturday between Siegfried and Götterdämmerung will offer “something completely different.” That evening jazz composer and pianist Valerie Capers has prepared a program entitled Wagner Takes the “A” Train. Working with bassist John Robinson III as collaborator, Capers has created and will present music conceived as a companion piece for Wagner’s epic score. This may not be quite as massive an undertaking as Wagner’s, but it is still a major one. Capers was the first blind person to graduate at both the Bachelor’s and Master’s levels with degrees in classical composition and performance from the Juilliard School, and she only made the shift to jazz after having acquired those degrees. There is thus every reason to believe that her understanding of Wagner is far more than a casual one. Nevertheless, this is not her first venture into Wagner territory, since she previously prepared a program for National Public Radio (NPR) entitled Adventures of Wagner in Jazz. For those who have not encountered her NPR project, Capers will precede her performance with a conversation with SFO Dramaturg Kip Cranna. This will give her the opportunity to reflect on how her own music-making has been influenced by the Ring and by Wagner on a more general scale. Capers is one of the composers affiliated with the African American Composers Initiative (AACI), which is dedicated to commissioning and presenting the work of both current and past African American composers; and all proceeds from Wagner Takes the “A” Train will be applied to the benefit of AACI. This performance will begin at 7:30 p.m. on Saturday, June 30. The venue will be the Recital Hall of the San Francisco Conservatory of Music. SFCM is located at 50 Oak Street, halfway between Van Ness Avenue and Franklin Street and a short walk from the Van Ness Muni station. General admission will be $25, and tickets may be purchased in advance online from a Brown Paper Tickets event page. At the end of last week, German choral conductor Hans-Christoph Rademann’s project with Carus-Verlag to record the complete works of Heinrich Schütz reached a milestone of sorts. The eighteenth volume in the project consists of 27 “chamber” settings of sacred texts published as the second volume published under the title Symphoniae sacrae (sacred symphonies). This follows the release of the first volume as the fourteenth volume in the Carus collection, which took place in March of 2017, and the release of the third volume as the twelfth Carus volume in January of 2016. As has already been observed, the title for each of these volumes was probably appropriated from Giovanni Gabrieli, who used it for two of his own collections. 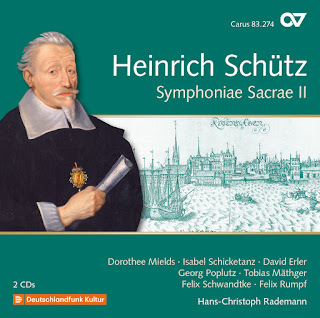 Schütz was no stranger to either Venice or the musical community there. Indeed, Venice provided him with refuge during the Thirty Years War, during which time both Gabrieli and Claudio Monteverdi, were both teachers and colleagues of Schütz. Presumably, Gabrieli had written his “symphonies” to be sung in the St Mark’s Basilica; and all the texts were in Latin. The same was the case for Schütz’ first volume, which was published in Venice in 1629. However, the remaining two volumes were published in Dresden in 1647 and 1750, respectively; and their texts are in German. It has also already been explained that the idea of a “symphony” has nothing to do with current semantics. Based on its Greek origins, the word refers to a “concord of sound,” which involves a consonant blend of different sources, both vocal and instrumental. In our own semantics we would probably call these pieces “sacred chamber music,” taking many (most?) of the aria and duet settings in the cantatas of Johann Sebastian Bach as a point of reference. With such “concord” in mind, Rademann has assembled an impressively diverse assortment of instruments, all of which play solo parts on the tracks to which they contribute. Those instruments are violins, zinken (a form of cornetto), recorders, trombones, dulcian (the predecessor of the bassoon), theorbo, violone, organ, and occasional percussion. In all probability the 27 pieces on this new recording were never meant to be performed as a group. However, through the diversity of both style and instrumentation, one can listen to either (or both) of the two CDs in the set from start to finish, simply because each track presents the music in its own characteristic light. As a result this new release makes for an engaging addition to the recordings accumulated thus far in Rademann’s project. The Curium piano trio was founded a little over a year ago by violinist Agnieszka Peszko, cellist Natalie Raney, and pianist Rachel Kim. The group is named after the 96th element in the periodic table, which, in turn, was named after the husband-and-wife couple of pioneering researchers into the nature of radioactivity, whose efforts earned them the 1903 Nobel Prize in Physics. Marie Curie has become a symbol of the innovations of female minds, past and present; and, in this respect, one of the motivations behind forming Curium was to develop a repertoire around female composers, both past and present. Programming has thus been organized around a balance between such innovative offerings and the more familiar piano trio repertoire. 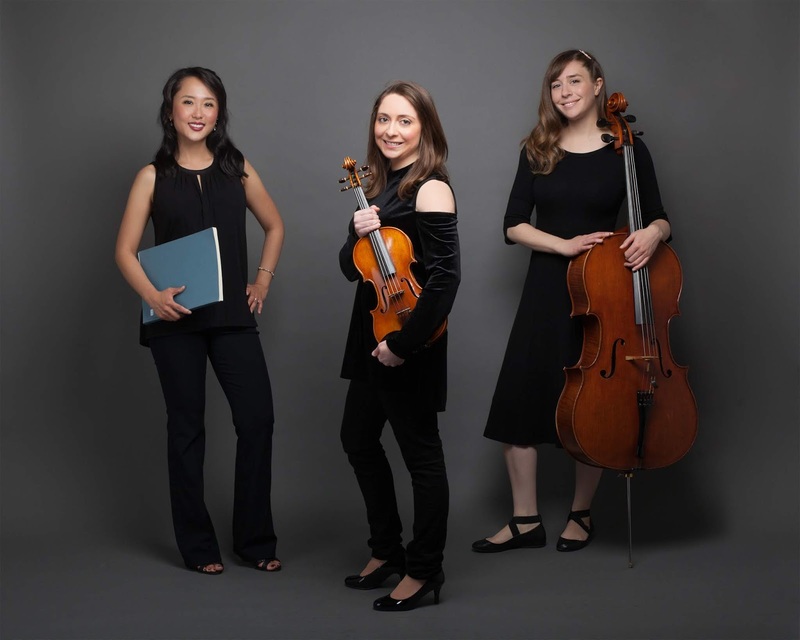 The group launched its 2017–2018 concert season this past November, and the first female composer to be presented in performance was Clara Schumann with her Opus 17 piano trio in G minor. Schumann composed this trio in 1846, not long after she and her husband Robert first met violinist Joseph Joachim, with whom she would have a long recital career as his accompanying pianist. Given that Robert had some experience with the cello, there is at least the possibility that the three of them would have been the first to play Clara’s Opus 17, even if they did not do so in a public concert. Last night in the Old First Presbyterian Church, Curium made its debut in the Old First Concerts (O1C) series; and they chose to begin the evening with two of Opus 17’s four movements, the opening Allegro moderato and the third (Andante) movement. This was a solid account of the score, and the abbreviation provided an opportunity to contrast the rhetorics of G minor and G major. By all rights this is a worthy element (connection with Curium only slightly intended) of the nineteenth-century chamber music repertoire; and there is no doubt that it holds its own with a confident hand. Before last night my only contact with the piece was through a recording made by the Beaux Arts Trio, and the piece definitely deserves more attention in recital settings. Perhaps Curium will lead the way to bringing this piece to the attention of a larger number of serious listeners. Opus 17 was complemented with a selection by one of the best known living female composers, Kaija Saariaho. Saariaho has written a fair amount of chamber music for strings; but, on the basis of the catalog of works on her Web site, “Light and Matter” is her only piano trio. It was composed in 2014 at a time when she was living in an apartment in New York, and the piece was inspired by her view of the changing lights and colors in Morningside Park. The resources of a piano trio are clearly more limited than those of an orchestra. Nevertheless, Saariaho has a firm command of “extended techniques” for both the piano and members of the string family. One could thus approach listening to “Light and Matter” with the same mindset required for “Laterna Magica.” The nature of the sonorities themselves were clearly different; but Saariaho’s techniques for structuring her work around such sonorities, rather than more conventional constructs, such as harmonic progression and polyphonic counterpoint, all seem to grow from a common source of roots. Curium had no trouble preparing a performance based on those roots, and they seemed as much at home when dealing with Saariaho’s expressiveness as they had been in their approach to Schumann. However, expressiveness was at its most intense during the second half of the program. This consisted entirely of Dmitri Shostakovich’s Opus 67 (second) piano trio in E minor. This trio was composed in 1944 around the same time as the composer’s Opus 65 (eighth) symphony in C minor. This was a period when the experiences of World War II had taken a significant toll on Shostakovich’s psyche. He had experienced more than enough, and his despairing weariness with it all emerges in both of these compositions. I remember when Scott Foglesong gave the pre-concert talk when SFS played Opus 65. He concluded by saying that he could not, in good conscience, conclude with the phrase “enjoy the music!” He said that the only parting remark he could give was “The Force be with you!” Opus 67 is very much in that same vein. The darkness begins with the mournful keening of the harmonic bowing of the cello strings, and the prevailing mood never gets any lighter. By the final movement one is immersed in persistent motifs of Yiddishkeit suggesting that Shostakovich knew more about the Holocaust than one was supposed to know. One might not be able to applaud Curium for “providing a good time;” but they definitely should be recognized for their blend of basic technical skill and rhetorical intensity, both of which are so critical to Shostakovich’s message registering with the attentive listener. Last night in Davies Symphony Hall, Russian pianist Daniil Trifonov concluded his residency with the San Francisco Symphony (SFS) with his one appearance with the ensemble as a concerto soloist. The concerto was Sergei Rachmaninoff’s Opus 30 (third) in D minor; and the conductor was Michael Tilson Thomas (MTT). This was the only work on the second half of the program, which began with Jean Sibelius’ last two completed symphonies, the sixth (Opus 104 in D minor) and the seventh (Opus 105 in C major). The movie Shine may be the worst thing that ever happened to Rachmaninoff’s Opus 30. It left the impression that the concerto was some sort of monster. If it did not eat pianists raw and spit out the “spare parts” (in idiom I picked in in Singapore), it still had the capacity to leave them mentally deranged. While this may have been the case for a pianist, one is not a statistic, as my father liked to say. Through attentive listening one can certainly appreciate the challenges posed by the piano part; but one can just as well recognize that a well-trained pianist determined to do so can rise to all of the challenges posed by the solo work that Rachmaninoff penned. Last night it was clear that Trifonov was such a pianist. Furthermore, he made that clear case through a straightforward approach to performing, never showing any signs that his was more like a wrestling match than a concerto performance. Indeed, one could even detect a smile or two when all of those thick waves of embellishment break and the calm sea of a more lyrical passage emerges. This was the key virtue of the partnership of Trifonov and MTT. Whether it involved piano solos or Rachmaninoff’s lush scoring for a full orchestra, both musicians consistently reminded us that we were there for a concerto performance, rather than a circus act. If the concerto imposed heavier demands than one might encounter elsewhere in the repertoire, Trifonov showed no signs of being fazed by the challenges. If the sonorities were a bit heavy on the lush side at a time when a new generation of composers was focused on emancipating dissonance, those of us on audience side could appreciate that, if Rachmaninoff could not let go of nineteenth-century traditions, he still knew how to shine new lights on them. Like Rachmaninoff, Sibelius is also often accused of not letting go of the nineteenth century. Nevertheless, there is a clear sense than in both Opus 104 and Opus 105 the composer is feeling “air from another planet” (to borrow a phrase by Stefan George that Arnold Schoenberg set to music in the final movement of his second string quartet). One often gets the feeling that Sibelius had focused his attention firmly on fragments, almost as if he was determined to break from the prolongations of traditional architectures that arose so frequently during the half century leading up to his two last symphonies. Indeed, the sense of fragmentation is so intense that the first two movements of Opus 104 have final measures that feel almost as if they are breaking off in midstream. Furthermore, in contrast to the lush use of instrumental resources in the earlier symphonies (the second symphony was first performed about seven years before Rachmaninoff’s Opus 30), these last Sibelius symphonies take an ambitiously exploratory approach to instrumental resources. His combinations never go against the grain of the guidelines one tends to learn in orchestration class, but there is frequently a fresh novelty in the sonorities that emerge as different combinations of instruments engage with each other. Furthermore, Opus 105 was organized as a single uninterrupted movement, almost like an orchestral response to Franz Liszt’s effort to organize his only piano sonata in B minor in the same way. The bottom line is that both Opus 104 and Opus 105 offer the attentive listener any number of possibilities for a journey of discovery; and last night MTT presented himself as a first-rate guide for such journeys.